Organized by state, this book provides you with all the facts and figures you need, including GPS coordinates, water availability, facilities, miles of trails, and much more, and it ALSO gives you delightfully written and entertaining diary excerpts about what the place is REALLY like! Consider it a personal review of the camp, with insights into what makes it a good or bad choice for you. You won't find another book on the market like this one! Nearly 500 fact- and fun-filled pages! 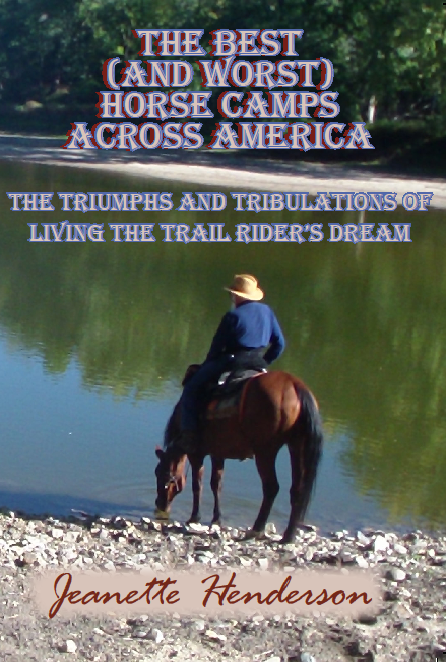 You won't want to be without it when you plan your next horse camping trip! "Love your book, received it yesterday, as always, you did a great job." Dee G.
"Excellent Resource!" and "Love it!" Tonya R.
"Full of great info." Cathy W.
"Got it in the mail yesterday. Really having trouble putting it down. Really enjoying how you wrote it and learning a lot. Thank you so much!" Dee L. R.
"Love the book...!" 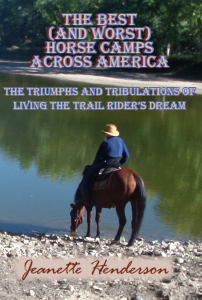 Andi L.
First and foremost, let me make it perfectly clear that this book is full of very subjective and opinionated reviews of over 250 horse camps in all 48 contiguous states, as well as commercial rides in Alaska and Hawaii, though it is hardly a complete list of what is available. Without a doubt, there will be people who love the places where we had terrible experiences, and vice versa, but having traveled as far and wide as we have, we feel our experiences will serve as a great guideline for the reader. The vast majority of camps we visited are on public lands, which often have limited facilities and charge minimal fees, if any at all. If you’re looking for comparisons between private ranches and resorts with lots of amenities, most of which charge a much higher fee accordingly, this is not the book for you (though we will likely produce one in the coming years). If you’re looking to get the most bang for your horse camping buck, and enjoy more of a wilderness setting than camping in someone’s back yard, then you’re in the right place. BE AWARE THAT WE MAY NOT RECEIVE YOUR CHECK FOR UP TO 4 WEEKS!! This is because we will be on the road with our horses, continuing our adventures! For faster service, however, email us at jeanette (-at-) equicamping.com, and if we have an address that will get your check to us sooner, we will provide it to you that way. In any event, when mailing a check, be sure to include your shipping address, as well as an email address so that we can provide you with a tracking number. Thank you!